At Sacae, a vast grassland spreading across the east of Elibe, a traveller collapses on their journey. This traveller (the player and Tactician) is rescued by Lyn, a swordfighter of Sacae, and the two journey together, eventually fighting to prevent the Lycian territory of Caelin from falling into villainous hands. 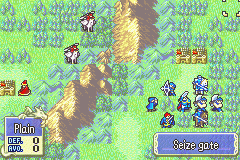 Along the way, they meet Eliwood, a noble of Pherae, who lends them his strength. However this journey is just a prelude to a much larger adventure. Eventually Lyn, the Tactician, Eliwood and Eliwood’s close friend, Hector, must join forces to tackle a powerful enemy who wishes to bring chaos upon the continent. Blazing Sword was released just over a year after the previous game, and once again for the GameBoy Advance. It continued the gameplay of the previous game, but improved it, slightly, in almost every possible way. This was a very important game, as it was the first Fire Emblem game to be released in English. Known as just Fire Emblem in the West, it introduced a wave of new English fans to the series. Luckily for new players, this was a great game to start with, as it was well executed and contained an indepth in-game tutorial to ease them in. The game was a prequel to the previous game, Sword of Seals, taking place on the continent of Elibe. Because the huge war has already taken place in the future, the story’s focus is smaller but, at the same time, deeper. The dialogue is as rich as ever, and the Support conversations, now improved in detail and length, continue to provide expanded character development. Meanwhile, despite looking and playing almost identical to Sword of Seals, there are plenty of changes and improvements. This time, players can be involved directly, as the group’s Tactician, which helps to immerse them into the story. Additionally, three main characters feature, each who have their own story and views. Otherwise there have been improvements all round, especially in the graphics department. Character portraits are more polished, and characters finally blink when speaking. Several battle sprites have also been reworked. The addition of CG artwork, which appear at spaced intervals in the game, was a welcome bonus. The game begins with Lyn’s story, a prelude to the main story that takes play a year ealier. As well as providing extra background to the story, Lyn’s story acts as a tutorial to guide new players or remind experienced players. Eliwood’s story is the main story, and can be played after finishing Lyn’s story. After completing Eliwood’s story, Hector’s story is unlocked, which is a slightly longer variation of Eliwood’s story. Before beginning the game, players are prompted to create a profile for themselves, as the army’s Tactician. They can choose their name, gender and month of birth (in the Japanese version, blood type could also be chosen). These affect the Affinity of the Tactician, which gives a small bonus to characters with the same Affinity. Also, characters often speak to the Tactician during the game, which helps the story to feel more personal and involved. In certain maps the weather may change, with rain or snow greatly reducing movement on the map. The weather changes randomly but characters, such as the fortune-teller, may hint at the changing of weather. 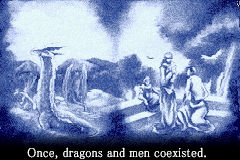 CG (computer generated) artwork had already existed in earlier games in the series, but they were small and usually only appeared in the ending. Blazing Sword introduced larger and higher-quality CGs, which appeared at key points during the main storyline. CGs seen in the main story can be viewed in the game’s Sound Room. A minor, but useful addition. After completing the game once, a new option, Support Conversations, appears in the Extras menu. There, you can re-read Support conversations seen in the main story, and keep track of which conversations have been obtained or not.